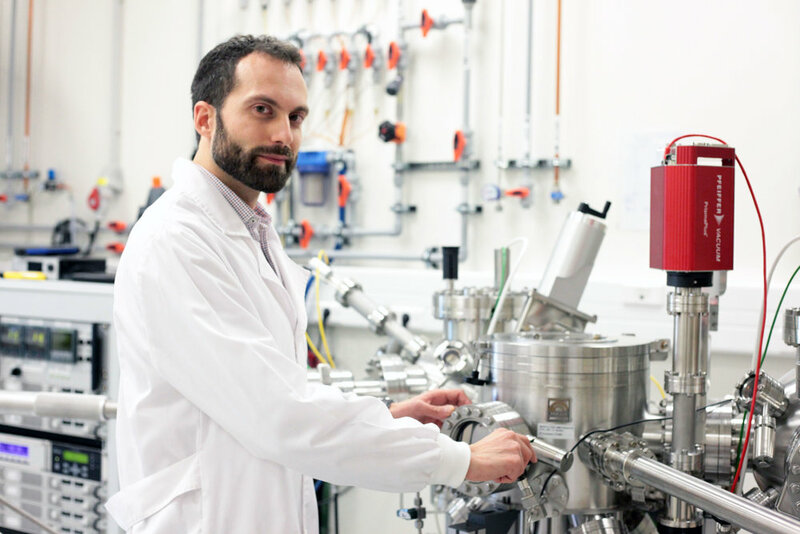 He obtained his Chemistry degree from the University of Genova (Italy) with a Master project carried out under Erasmus at Cranfield University (UK). Diego was awarded his PhD by the University of Bath (UK) in 2012 with a thesis on chalcogenides for solar cells supervised by Prof. Laurie Peter. He then moved to Luxembourg, where he spent three years as a postdoc on the FP7 project SCALENANO, focusing on photoelectrochemistry as a predictive and monitoring tool for solar cell performance. In 2015 he received a CORE Junior grant by the FNR Luxembourg allowing him to be the principal investigator of GALDOCHS, a two-year project on gas phase alkali doping of chalcogenide semiconductors. GALDOCHS has involved five partners from Luxembourg, Italy, France, UK and Switzerland and has helped to unveil some fundamental consequences of extrinsic doping in Cu(In,Ga)Se2, the world’s most efficient thin film photovoltaic technology. Surface patterning is essential for technologies spanning microelectronics, sensing, catalysis, photonics, energy storage and conversion. However, it is generally time consuming and energy intensive. The aim of Diego Colombara’s project is to develop a template-free route for micropattern fabrication yielding higher throughputs at lower costs. As a proof of concept, patterns produced within the project will be specifically targeted for two applications that are currently investigated at INL: (1) micro-concentrator solar cells  studied at the Laboratory for Nanostructured Solar Cells (LaNaSC) group led by Sascha Sadewasser and (2) photoelectrochemical (PEC) water reduction  studied at the Nanomaterials for Energy Storage Conversion and Sensing (NESC) group led by Lifeng Liu. (1) Cu(In,Ga)Se2 micro-concentrator solar cells are a new generation of photovoltaic systems offering several advantages over the conventional thin film architectures. The reduced material utilization translates into intrinsic material savings, while the light concentration translates into efficiency enhancement in a win-win fashion. Of course, these advantages come at the expense of an increased manufacturing complexity: the micropattern fabrication. That’s where Diego’s project comes into play. (2) Si nanowires (SiNW) decorated with cobalt phosphide offer an efficient route to hydrogen production from photoelectrochemical water splitting. However, the lifetime of the photocathodes was shown to be limited by the progressive oxidation of the uncoated sides of the SiNW. Diego aims to employ the template-free patterning technique to obtain microwire (MW) arrays with lower feature density (larger wire-to-wire distance), in an attempt to prevent bundling of wires and increase the cobalt phosphide surface coverage. S. Sadewasser, P. M. P. Salomé, and H. Rodriguez-Alvarez, “Materials efficient deposition and heat management of CuInSe2 micro-concentrator solar cells,” Solar Energy Materials and Solar Cells, vol. 159, pp. 496–502, Jan. 2017. X.-Q. Bao, M. F. Cerqueira, P. Alpuim, and L. Liu, “Silicon nanowire arrays coupled with cobalt phosphide spheres as low-cost photocathodes for efficient solar hydrogen evolution,” Chem. Commun., vol. 51, no. 53, pp. 10742–10745, Jun. 2015. The article “Sodium enhances indium-gallium interdiffusion in copper indium gallium diselenide photovoltaic absorbers” of Dr. Diego Colombara was published in Nature Communications on 26th of February 2018. This article is about how photovoltaic solar panels convert sunlight into electricity. For this to happen, sunlight must be absorbed by an active component called the absorber. In absorber materials, the incident light is able to excite electrons. One type of absorber is composed of many small grains packed into a thin layer (typically one hundred times thinner than a hair). The grains contain several chemical elements (such as copper, indium gallium and selenium). The distribution of these elements through the layer is designed to direct the flow of electrons excited by the sunlight to generate the maximum electric power. In this work, we show that if the absorber is made of only one grain, adding a small amount of sodium helps to homogenize the distribution of the elements. It is astounding because more than 20 years of previous research have consistently shown the opposite effect on absorbers made of many grains. Thanks to these results, we can now conclude that sodium has a dual effect: it homogenises the elements inside each grain, but it slows down homogenization from grain to grain. The poster received the interest of notable figures in the field, from CTOs to experts of alkali metal doping in Cu(In,Ga)Se2-based solar cells. Following the very positive reviews of the extended abstract, this contribution was invited for submission to the IEEE Journal of Photovoltaics. The associated manuscript was expanded and is currently under review. This contribution was awarded the best poster prize of the session. SPECIFIC, College of Engineering, Swansea University, United Kingdom. The session was attended approximately by 100 people and the presentations received two questions each on average, from renowned scholars such as Daniel Lincot (IRDEP, France) and Angus Rockett (Colorado School of Mines, USA). The contribution awarded at the 7th World Conference on Photovoltaic Energy Conversion in Hawaii has been elaborated further and is now published open access. Concentrator solar cells based on Cu(In,Ga)Se2 micro islands offer the double advantage of reducing substantially the reliance on scarce elements such as In and Ga, while increasing the theoretical power conversion efficiency of the device beyond the AM1.5 Shockley-Queisser limit. The realization of highly efficient devices of that kind is not possible yet. This contribution describes the origin of an issue related to the fabrication of CuInSe2 micro islands by electrodeposition. Electrodeposition enables to deposit CuInSe2 in a wide range of 2D features, when coupled to cleanroom technology. Foremost, the deposition occurs in an area-selective manner, which means that the material ends up just where it is supposed to be, virtually achieving 100 % material efficiency. The reality, however, is more nuanced. Due to differential diffusion dynamics of the ions employed for the electrodeposition, the edges of the micro islands may be subject to outgrowth compared to the centres of the micro islands. This contribution supplies the experimental observation of the issue and provides numerical simulations to integrate the phenomenon to the knowledge of non-plating electrochemical current at the surface of ultramicroelectrodes. Despite this issue, the novel photovoltaic concept has been demonstrated with a 4.8 % measured power conversion efficiency under non-concentrated simulated sunlight. More research is ongoing to improve further the laboratory efficiency of the device. The successful demonstration of the concept paves the way to a more attractive solar energy technology.